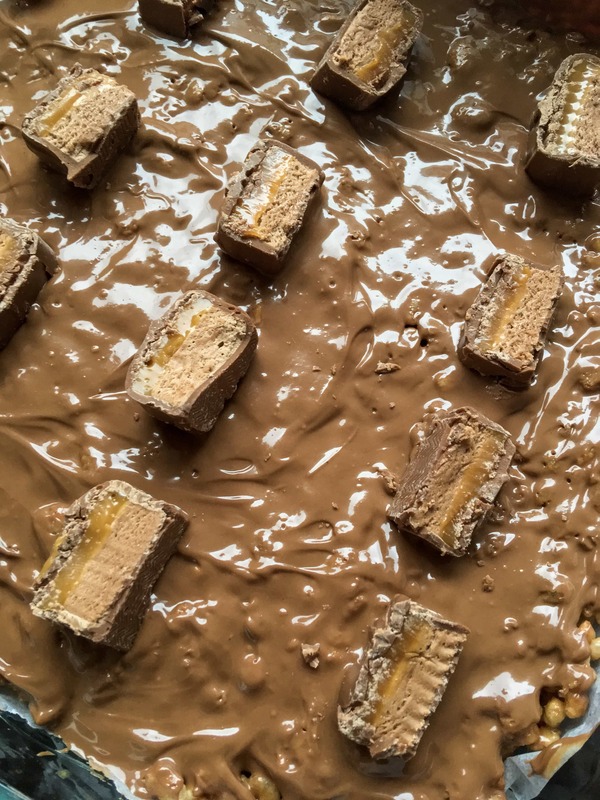 This Mars bar crispy cake is a children’s party classic – grown ups can’t resist it either! I hadn’t actually planned to post this recipe since it’s extremely simple and easy, but this is such an old classic I couldn’t resist. I often make this for children’s parties where it is devoured by both kids and adults! I am not safe around this stuff at all. I find it extremely addictive. It’s just as well my husband and boys love it as much as I do! This kid’s Birthday party classic couldn’t be simpler to make…. 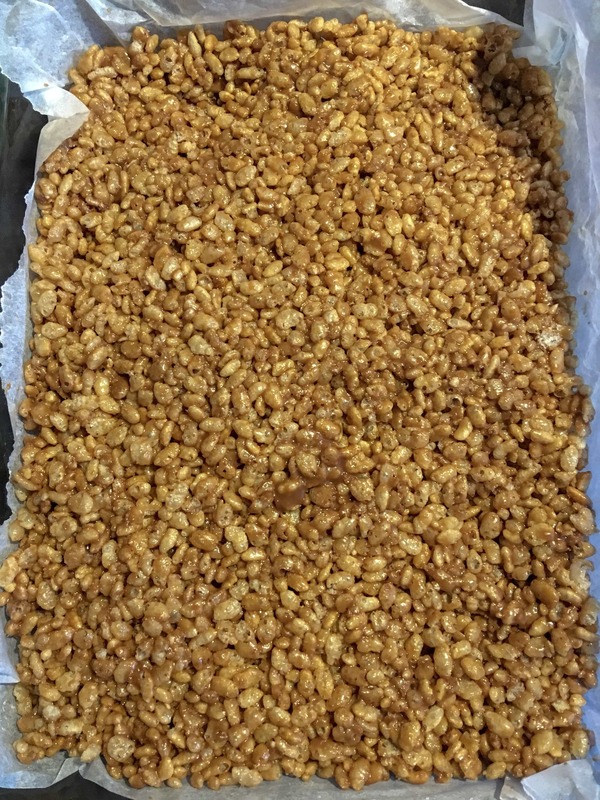 When the mixture has melted, pour in rice crispies and stir in the crispies. Mix together well, then pour into a lined tin. Let to set for a while before covering with melted chocolate and decorate with chopped Mars Bars. This recipe was originally published 24th August 2012. Republished 12th January 2019 with new photographs. This easy, no bake Mar Bar crispy cake is universally loved by kids of all ages! It couldn't be easier to make. 4 Mars Bars, chopped (the "standard" size weigh 51g each - the bars from the multipack are 39.4g so if you're using these, you will need 6 bars! Grease and line a 9x9 baking tin with baking parchment. 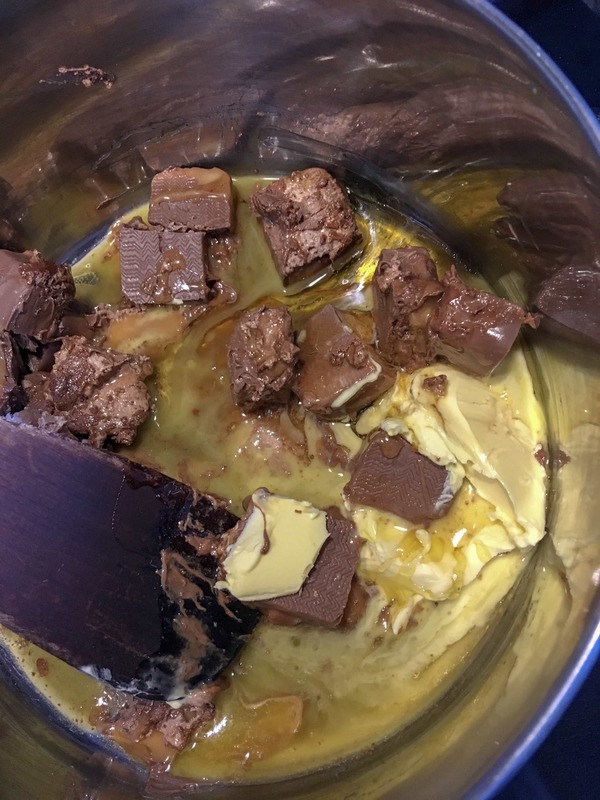 Melt the Mars Bars, butter and golden syrup together over a low heat in a large saucepan. 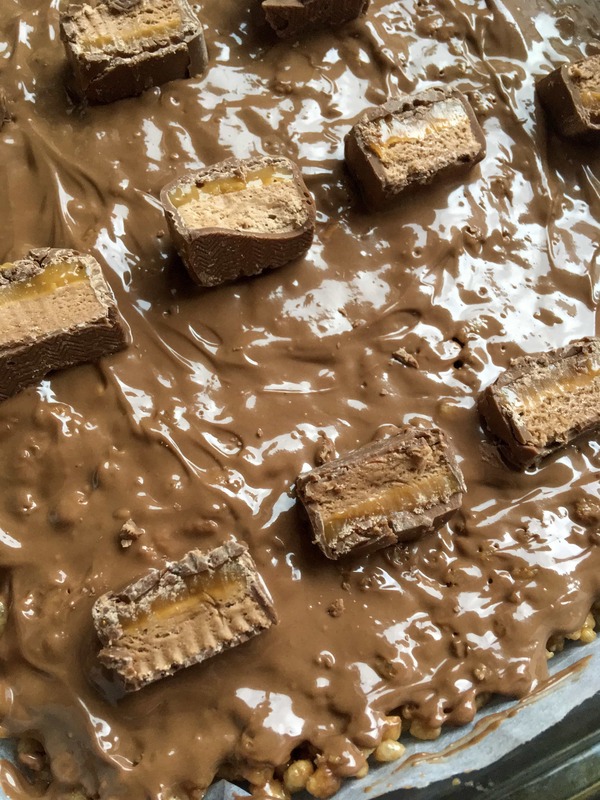 The nougat in the Mars bar will take a while to melt down so keep stirring until you have a smooth, melted mixture. Pour the rice crispies over the melted mixture and stir very well until all the rice crispies are coated. Pour into the tin, smooth the top and pop in the fridge while you melt the chocolate for the topping. Melt the milk chocolate in the microwave or in a heatproof bowl set over a pan of simmering water. Pour the melted chocolate all over the crispy cake. Decorate with chopped Mars Bar pieces if desired. Leave to set in the fridge for about an hour before cutting into slices. OMG I cannot believe how delicious this looks. I had to look up what a Mars bar is. I think we have something similar in our Milky Way bar. One day when I need something sweet and fast, I have to try this. Good luck in the contest! Sign me up for this! Thanks! It’s such a quick and easy recipe, everyone seems to love it. The batch I made yesterday is all gone, believe it or not! I’ve already been asked to make a second! I love a no bake slice as well. mmm mmm! I totally agree – this simple bake is elevated into stratospheric yumminess by using mars bars. I’m afraid I would become addicted to that also…but I’m going to make it anyway! I love them too 🙂 This one is so easy, yet very rewarding! My sister made these for me a few years ago and I loved the concept of using the mars bars as the marshmallow glue! So clever and delicious. Thanks for reminding me about these! and (the best part) sampling different cupcakes. success, you have to throw that “hobby” label out – it’s time to work.